On May 24, 2018, the National Advisory Council on Institutional Quality and Integrity (NACIQI) convened a hearing on the topic of “Oversight of For-Profit Institutions’ Conversions to Non-Profit Entities.” As subsequently reported in various media accounts, the hearing quickly devolved into a one-sided, partisan attack on the for-profit education sector, promulgated by a lineup of more than 20 witnesses that included a number of well-known opponents of for-profit education. Given the personalities involved, the lack of balance among panelists, and the repetitive positions staked out by these panelists, we ordinarily would choose to move on. Unfortunately, the hearing also included witnesses who focused their testimony on specific institutions, including Grand Canyon University. Even more unfortunately, this testimony was rife with inaccuracies, faulty conclusions and opinions masquerading as legal analysis, and summaries of this testimony made its way into public media accounts. As an institution with over 90,000 current students, over 140,000 proud alumni, and over 10,000 employees, we feel it is our obligation to respond in order to set the record straight and ensure that our students, alumni, employees and other stakeholders know that we will fight on their behalf so that Grand Canyon University gets the recognition it deserves for its specific record and its specific accomplishments. We agree that higher education should be regulated and fully support measures that ensure regionally accredited educational institutions are meeting recognized standards – particularly as it relates to student support services, academic integrity and financial transparency – and believe those regulations and measures should apply to all institutions (for-profit and nonprofit). We have been complimented frequently when GCU representatives make presentations on those standards at education conferences across the nation. We therefore strongly disagree with the notion portrayed by the NACIQI witnesses that all for-profit schools operate in the same fashion or that all proposed nonprofit conversions involve attempts to circumvent regulations or otherwise violate the law. First, Grand Canyon University is not seeking to return to its nonprofit roots as a way to avoid regulatory scrutiny. As it relates to federal regulations aimed only at the for-profit sector, the University has a very strong track record. Because GCU maintains affordable tuition and our graduates are earning good-paying jobs, none of our programs failed the gainful employment regulations. GCU has not raised tuition on its ground campus in 10 years, which as you know is unheard of in higher education. For the 90/10 rule, GCU sits at 72.3% (and dropping). GCU’s draft loan default rate is 6.2% for the most recent cohort – well below federal guidelines. That figure is extremely low among institutions with large online student populations. Graduates at GCU are incurring less debt (an average of $18,750) than the average at public universities ($25,550) and far below the average at nonprofit private universities ($32,300) or for-profit colleges ($39,950), according to data from the Institute for College Access and Success (a noted critic of for-profit schools). Because of the generous institutional aid that more than 90 percent of our traditional students receive, students pay an average of $8,600 per year in tuition (excluding federal Pell grants, loans and external scholarships), which is far below published rates at private universities and on par with state universities. The University also has an exemplary record of regulatory compliance, including visits from six major accrediting bodies within the past two years. GCU met those comprehensive reviews with 100 percent compliance, including a visit from HLC in which the University’s accreditation was reaffirmed for an additional 10 years, which is the maximum extension of accreditation the HLC offers. Second, we need to address in particular the testimony given by Georgetown University law professor Brian Galle at the NACIQI meeting regarding a proposed transaction involving Grand Canyon University. 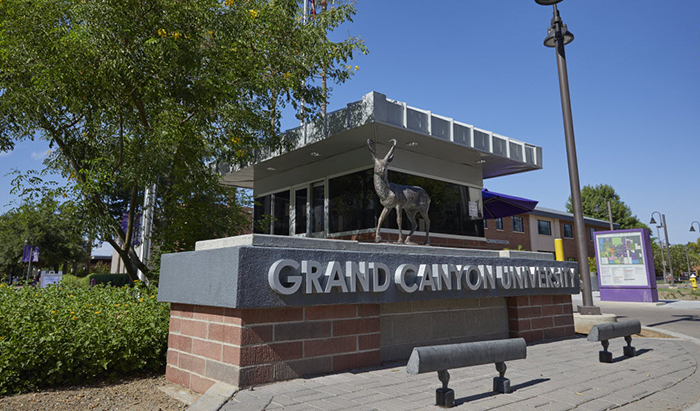 In this transaction, Grand Canyon Education, Inc., currently the owner and operator of Grand Canyon University, would sell assets comprising the University – including the substantial real estate of our main campus – to a nonprofit entity. Thereafter, this nonprofit Grand Canyon University would enter into a services agreement with Grand Canyon Education in which the latter would provide marketing, enrollment, technology and other services to the University. Overlapping governance. Prof. Galle states that “the new nonprofit would also be governed by a board comprised mostly of people who already sit on the for-profit board.” This is false. In reality, upon the closing of the transaction, the board of New GCU will consist of members who are entirely different than the board members of Grand Canyon Education. Overlapping management. In a similar vein, Prof. Galle states that the University “is operated by a group of individuals who serve two masters, and who presumably are well compensated by for-profit GCU’s investors for serving the interests of those investors.” This is false. Once again, this statement has been simply made up by Prof. Galle. Mr. Brian Mueller, who has been the CEO of Grand Canyon Education for 10 years and the President of Grand Canyon University for six years, may continue to serve in both roles if selected to do so by the respective independent boards and at no additional compensation. In that case, a corporate governance framework, reviewed and passed upon by both the IRS and the University’s accreditor, would be in place to ensure that he does not have any direct role in managing the relationship. Other than potentially Mr. Mueller, however, there will be no overlapping management or employees between the two entities. Debt Service. Prof. Galle states, without any knowledge of the University’s financial capacity, that it would be exceedingly difficult for the University to make its annual debt-service payments and that this will put financial pressure on the University to maximize revenues. This is false. Grand Canyon University is a major success story in the world of higher education, and its financial success as a university has been achieved while keeping tuition on its ground campus flat for the last 10 years while raising tuition for its online students only nominally over that period. Under the terms of the proposed transaction, the University would generate cash flow well in excess of its debt service obligations. Further, Prof. Galle fails to note that, in return for taking on an $800 million obligation that will require $48 million in interest payments each year, the nonprofit University is acquiring $800 million of hard assets. These hard assets consist of over 270 acres of land in the heart of Phoenix, Arizona, as well as buildings that house and operate a 20,000-student ground campus operation, nearly all of which have been built in the last seven years. If the University ever felt financial pressure, it would have the ability to sell these hard assets and pay back the debt (as many universities throughout the country do from time to time). Violation of IRS Rules. Prof. Galle states, based on his misinformation and faulty conclusions, that “GCU’s proposal fails the control test” under IRS rules. This is false. The nonprofit has hired independent legal, tax, financial advisory and valuation experts to ensure that the proposed transaction meets all applicable legal, financial and regulatory requirements. To date, the proposed transaction has been fully vetted and the relevant component parts approved by the IRS, Grand Canyon University’s accreditor, and the Arizona state education licensing authority. Prof. Galle’s purported legal conclusion is simply his personal opinion — and his attempt to substitute that opinion for the conclusions of those bodies that actually have access to full information and have fully vetted the proposal — should not be taken seriously. Services Arrangement. Overall, Prof. Galle’s role is to attack the business model whereby the nonprofit University will receive services from Grand Canyon Education in return for a share of the University’s revenue. In analyzing a proposed structure for returning to its nonprofit status, it became quickly apparent to Grand Canyon University that, rather than being something newly devised by the targets of Prof. Galle’s testimony, the third party services model was and is a model deeply embedded throughout the higher education world. Schools such as the University of North Carolina – Chapel Hill, Purdue University, the University of Southern California, Yale, and Prof. Galle’s own Georgetown are parties to outsourced services agreements with for-profit companies who are paid a portion of the university’s revenue to operate online programs and provide other related services. Prof. Galle knows this – or should know this – and his disdain for these types of arrangements is misplaced given that his own employer was an early adopter of this model. All services that the nonprofit University will be outsourcing to Grand Canyon Education are services that are currently outsourced by universities around the country. Moreover, the University has commissioned studies to ensure that the rates and terms of the services arrangement are consistent with market norms. As Grand Canyon University returns to its nonprofit roots, we hope that it will be judged on its merits and not made the subject of a partisan, philosophical debate about for-profit vs. nonprofit education. Grand Canyon University was founded in 1949 as a nonprofit institution and continued in that form for almost 55 years. On the verge of bankruptcy in early 2004, it was acquired and converted to a for-profit entity. Since 2008, Grand Canyon University has an unparalleled record of success in the higher education world, as evidenced by its ever growing enrollment, increasing graduation and retention rates, successful student outcomes, leading NCAA Division I sports program, and brand new $800 million campus, all of which it has achieved while enrolling a student body primarily comprised of diverse students and working adults and without raising tuition on its ground campus and only nominally raising tuition for its online students. Grand Canyon University is excited to return to its nonprofit roots as a means to ensure the future success of the institution and its students for generations to come. This is very insightful and detailed especially for alumni like myself (2005-2009- MBA). Good job GCU, so proud of all the achievements in such a short time. Great to learn of going back to nonprofit way! As an outsider coming in as a new employee with GCU, I can tell most assuredly, GCU has no subverted nefarious motivations. GCU’s service to the community and veterans is totally legit! This sounds like an attack from the institution of status quo quid pro quo! I am so proud to be a part of Grand Canyon University!! Regarding the article, it is both shocking and disappointing that a Prof from a well-known educational institution would make arguments without accurate information and properly checking his sources for facts and credibility. One of the first lessons in academic research and writing is to vet and use credible sources of information and to support one’s arguments with tested data, and provable facts. I wonder how the leaders at Georgetown view Prof. Galle’s biased and unfounded rantings?